Although most ad blockers boast of their ability to remove ads from the sites you visit, Bad Ads Blocker boasts of its ability to speed up your Internet speed. As a matter of fact, currently this program is not supported by any official information, as the official website, advantagz.com, is down. We are not sure whether or not this site will be up in the future, but, right now, this is one of the many reasons to remove Bad Ads Blocker from your Mozilla Firefox browser. The thing is that this suspicious program is not supported with legal information, which makes it unpredictable and strange. Just like Fastoplayer, TranslateAsYouGo, and many other suspicious ad-supported programs that deserve removal, Bad Ads Blocker works only on Mozilla Firefox. It is unclear why Super Web Accelerator has made this product for this particular browser, but we do not dismiss the possibility that other browsers will be infected with this adware in the future. As soon as Bad Ads Blocker gets installed, it starts tracking you. The data-tracking tools employed by this program are likely to be used by third parties that Super Web Accelerator is associated with. Since we do not know anything about these parties, you should not allow them to gain access to your data, and this is one more reason to remove adware. 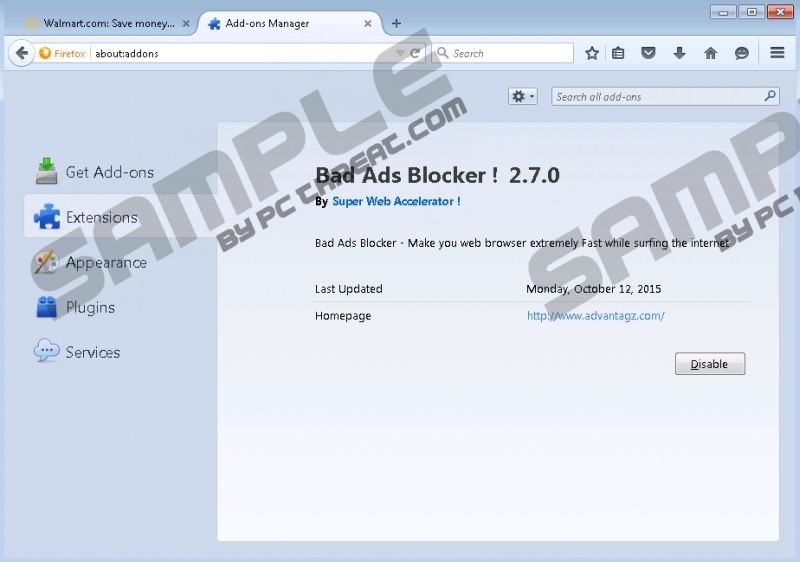 Bad Ads Blocker records information that can help create ads that attract clicks. The more clicks you make, the more money the creator of this adware generates. This is why it is not surprising that this program can showcase many different kinds of ads, including flashy banners and irritating pop-ups, up until removal. We are hopeful that some of these ads will be harmless, set up to only promote third-party products. Unfortunately, since Bad Ads Blocker is unpredictable, you have to think about other scenarios as well. What if the ads shown were used to distribute malware? If this was not a possibility, we would not be talking about the removal of this adware. It should be obvious to you by now that it truly is best to delete Bad Ads Blocker. Unfortunately, we have to think about other threats as well. Because this program is no longer introduced to users in an official manner, it must be distributed via software packages, and they could include malicious, removal-deserving programs. It is important to remove Bad Ads Blocker, but you cannot ignore other threats either. Luckily, there is a way to delete malware and unreliable programs all at once. It is likely that your operating system is not protected in a reliable way. If you used legitimate security software, you would not need to worry about Bad Ads Blocker or other suspicious programs infecting your operating system. Hopefully, it is not too late to fix this and eliminate security threats. Luckily, you can take care of Windows protection as well as delete unreliable software using one step. All you have to do is install a trusted antimalware tool, and you will have a chance to forget about security problems. Launch Firefox and tap Alt+T to open the Tools menu. Select Add-ons to open the Add-ons Manager menu. Click Extensions to find all Firefox extensions installed. Click Remove and restart your Firefox browser. Quick & tested solution for Bad Ads Blocker removal.